Treat yourself to an enjoyable and unique day in the heart of Umbria and black truffle culture. Your Truffle Hunting in Umbria adventure with Wild Foods Italy is a day immersed in the culture and traditions of our family who have been hunting truffles in this region of Italy for centuries unknown. Our ancestral village of Pettino and the mountain forests and pastures have been owned by our family since the year 1486. Spend the day with us with our colorful family members, where we’ll share many of our culinary and cultural secrets. 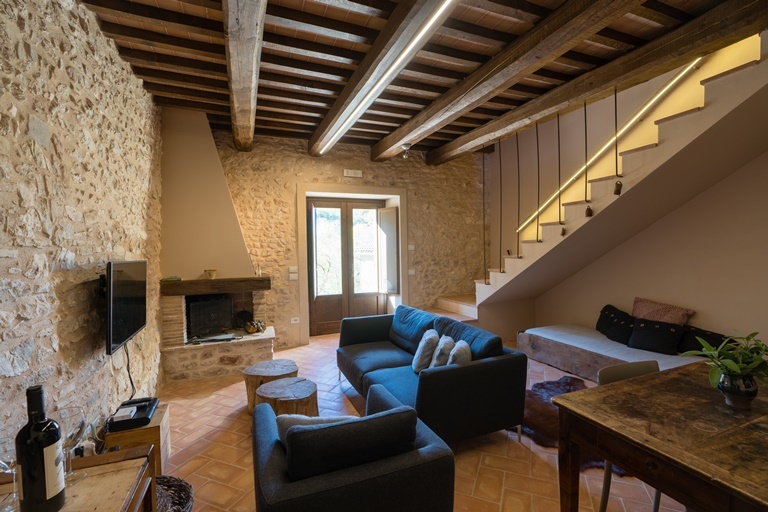 We’ll treat you to some amazing Umbrian hospitality, where you’ll experience fantastic food and local wine and enjoy some really spectacular landscapes and scenery. The truffle hunt starts from our mountain village of Pettino, nestled among the beautiful rolling hills and valleys of our farm. Our expert truffle hunters are all part of the family, and we have many highly-trained dogs who just love their jobs sniffing out truffles. We follow them though the truffle-rich forests and pastures at a leisurely pace as the dogs work searching for the prized Umbrian truffles. There are amazing views to be had in every direction as we stroll through the countryside and hunt truffles. At times it happens quickly, sometimes it takes longer, but sooner or later we’ll have enough truffles for an Umbrian hunter’s traditional lunch. We’ll stop in a picturesque spot in the hills where you’ll have your first taste of a freshly dug truffle. You can savor this moment with a glass or two of Prosecco too. More often than not, our shepherd, the flock of sheep and our wolf-chasing dogs come join us for some company, a drink and a chat. If you are in need of some dog affection, this is the time to get it – we have many very friendly dogs. Then back at the village you’ll discover some more of the secrets of our family’s culinary tradition. Francesca accompanies us to the pasta room where you can learn to make the traditional fresh pasta of the village. You’re welcome to join in or otherwise just sit back and enjoy the experience. We’ll keep the truffle snacks coming as well as many of our homemade delicacies such as prosciutto, salami and of course Francesca’s famous pecorino cheese. And of course, loads of great local wine. The day then continues with a big traditional Umbrian lunch filled with meat and vegetables from our farm, as well as our own olive oil and of course freshly hunted truffles. Family, friends and truffle hunters join us for a relaxing, fun and totally authentic lunch. Because we will walk in the countryside, it is not recommended for people who have difficulty walking. However, you are welcome to wait in the vehicle and then enjoy the rest of the day in the village. Want more than one day of Umbrian cuisine & culture? If one day seems little then stay with us at the Black Truffle Lodge, all-inclusive. Experience a piece of Umbrian culinary culture every meal. Stay 2 nights and enjoy the Wild Foods Truffle Hunt at 50% off. Why not spoil yourself with our most exclusive experience? Treat yourself to the exclusive Wild Foods Epicurean Experience for 3 nights 4 days. 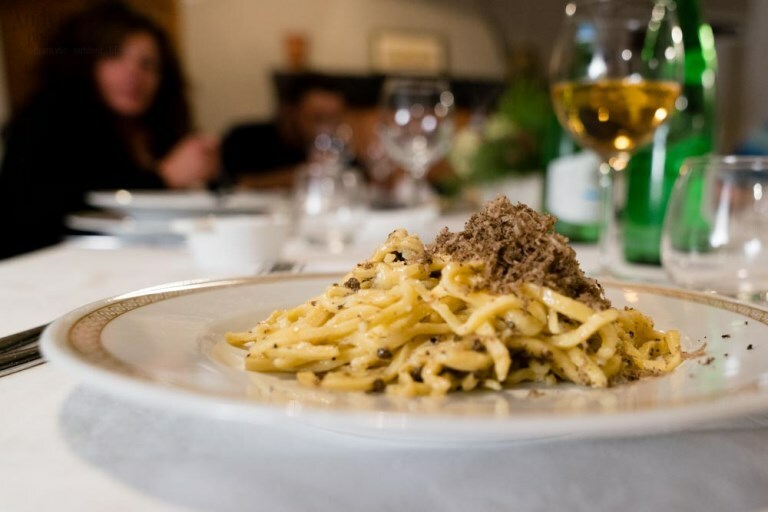 Leave everything to us and enjoy private truffle hunting, traditional Umbrian cooking lessons, amazing landscapes and scenery, topped by fine wining and dining.